The volume of information in the healthcare industry continues to grow exponentially. 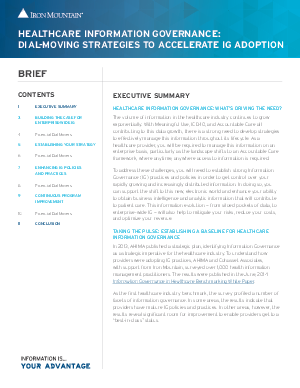 With Meaningful Use, ICD-10, and Accountable Care all contributing to this data growth, there is a strong need to develop strategies to effectively manage this information throughout its lifecycle. As a healthcare provider, you will be required to manage this information on an enterprise basis, particularly as the landscape shifts to an Accountable Care framework, where anytime, anywhere access to information is required. To address these challenges, you will need to establish strong Information Governance (IG) practices and policies in order to get control over your rapidly growing and increasingly distributed information. In doing so, you can support the shift to this new, electronic world and enhance your ability to obtain business intelligence and analytic information that will contribute to patient care. This information evolution — from siloed pockets of data, to enterprise-wide IG — will also help to mitigate your risks, reduce your costs, and optimize your revenue.